The attractive gift box is made with sustainably harvested Himalayan lokta paper on top of a recycled paper board. Inside the 3.5 inch square box you''ll find a cushion, striker and 3 inch diameter singing bowl along with instruction for care and how to use the bowl for a simple meditation. Sheep’s wool is an amazingly adaptable fiber. It can be dyed any color and when hand felted using warm mildly soapy water it can be molded into any shape, or then cut and sewn together as per your imagination. Because the felting and most of the stitching process is all done by hand with natural materials that can be sustainably harvested, hand felted products have a relatively soft impact on the environment. 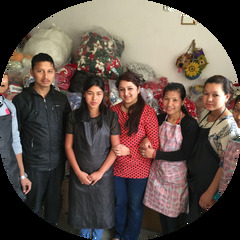 Commercial exports of felted products from Nepal have grown exponentially since around 2000, benefiting thousands of mostly women workers, production managers and family businesses who help support their families and educate their children with their earnings.